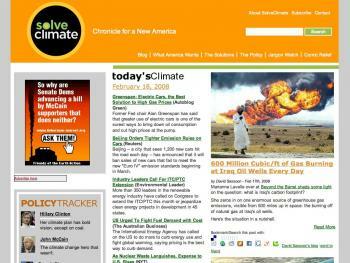 SolveClimate.com is news and information site focusing on climate change related news. Blog entries are added to the site and related to other content along 3 axis: politicians and candidates, constituency groups and major solutions to climate change. The goal of the site is to show that there is common cause amongst disparate groups of Americans for progress on major climate change solutions. To achieve the site’s mission, a CivicActions team consisting of project manager, information architect, lead engineer, theme engineer and application specialist worked with the client and a third party designer using Drupal and contributed modules to develop a visually appealing and well functioning site. The site makes significant use of CCK, Views and Panels, as well as Node Auto Term and other taxonomy based features to pull together content consisting of blog entries, profiles, nodes describing solutions as well as candidates policy positions on those solutions and a glossary around the three axis mentioned above. Users can sign-up for the site and subscribe to email updates based on categories (via the subscriptions module, or simply subscribe to RSS feeds. We are also using a variety of techniques maintain site responsiveness during periods of high volume as a result of social bookmarking sites like Digg.